Most all of our top wedding venues require some sort of adventure, and the chairlift ride up to Solitude Station is what makes this one of our favorite. The Village at Copper Mountain has plenty of lodging for guests, as well as many summer activities, such as fireworks every Saturday night. The actual ceremony location is to die for. It overlooks the Gore Range and could not be any more beautiful. While the actual lodge on top may be a bit dated, there are many reception possibilities from large to small at the village base. 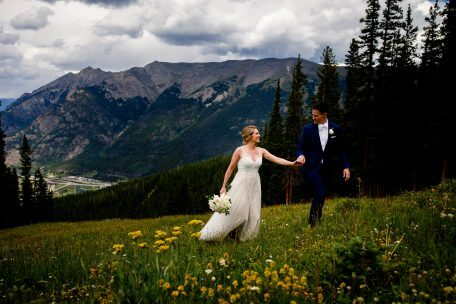 As for wedding ceremony locations, Solitude Station is a favorite when it comes to the mountains in Colorado.